I'm glad I don't have any more scraps of this material. 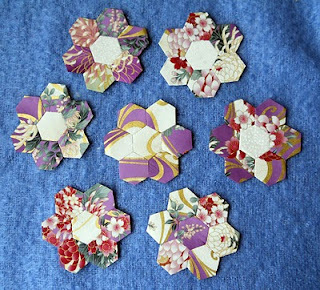 This week I was reminiscing about the pen-pals we had in our youth, before the days of the internet and e-mails, and one of my hexie-swap bloggers came up with the term "fabric pen-pal" which I think is quite brilliant for describing the interaction between swappers of hexies or blocks. I'll have to have a rest from hexies for a few days as I have a hole in the end of the middle finger of my right hand from pushing the needle through ! I don't get on very well with thimbles. But when I start again it will be with some softer colours to balance out these bright hexies. Love your hexies! I had the same problem with my middle finger so recently I forced myself to learn to use a metal thimble. It was awkward at first but it does make a big difference. A friend of mine swears by stick-on thimble tabs but I've never tried them. I also poke my finger too often to count. I can't feel all the layers of fabric with a thimble. So when it comes to the heavy stuff and I have to use a thimble or bleed to death, I do use little sticker pads. I believe they are called "thimble-it". Give you finger a rest, and use some lotion ( or bag balm, in the green tin) on it to sooth the pain. Your hexies look great cut from the same, large patterned fabric. lovely hexie flowers. I can sympathise with your finger issues. You can always bet that the needle head will hit that sore spot every time! I love those hexi's they are great. I have the same problem with my fingers and sometimes use the rubber paper turners(don't know if they are called thimbles) because I can't use a metal one. I've also tried a plastic one from the thimble lady but I lost it!!!! I'd love to have a fabric penpal especially for hexis! want to finish that hexi flower quilt this centry!! !